The Ultimate Outdoors Workers Cool Hat with Earmuff Slots. Finding a hat with a wide brim and neck flap to provide protection from the sun, and to be able to wear with ear muffs is daunting. Your search is over ! Simply the best hat for outdoor workers, required to wear earmuff protection, is here ! The Australian design registered Ultimate Outdoors Cool Hat can be used for two purposes. This lightweight hat can be worn comfortably whilst wearing earmuffs. But it can also be worn as a normal hat because it has a flap of material that covers the earmuff slots which makes this Cool Hat the same as the normal Great Outdoors Cool Hat. You may not be making a fashion statement with this hat, but it’s exactly what prospectors, traffic controllers, builders, lawn mowing contractors, farmers... every outdoor worker needs. This will become your favourite hat ! 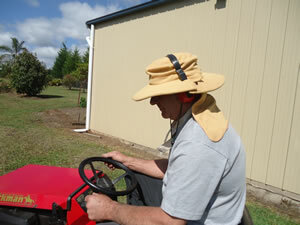 If you are going for comfort and practicality, you cannot go past the Australian designed Ultimate Outdoor Workers Cool Hat with earmuff slots. Brim has two openings that are covered with a flap enabling the hat to be worn normally. These two earmuff slots, secured by Velcro, can be opened up to allow the wearer to wear earmuffs comfortably. Wide brim holds its shape. Squashes. Crushes. Fuss-free hardy hat perfect for protecting and cooling outdoor staff. The Cool Flap fits discreetly into the rear portion of the brim. This Tuck Away Cool Flap unrolls and loosely drapes over your neck to act like a vented veil to provide added air flow whilst still delivering full sun protection. But it can be tucked away until you want to use it. The totally breathable crown provides total air flow around the entire circumference of the hat. Double crown in which to place your Cool Pad that comes free with your hat. Water Repellent, SPF 50 fabric protects you. Chin strap keeps it in place in the wind. This strap has an inbuilt Safety Snap that snaps apart if the chin strap gets caught, thereby protecting you from choking. Australian Registered Design Number 339245. C OLOURS : Navy and Natural Beige. CARE: Throw your Ultimate Outdoors Workers Cool Hat into the washing machine. PROMOTIONAL: We can now supply promotional Cool Hats, embroidered with your logo (minimum of 100). Contact us today for more information.